Every Blogger wants their blog posts to get index by Search Engine faster as soon as they write the post. There will be two sections every blogger works on first Pre-writing and second Post-writing. When a blogger completes the pre-writing work then the post writing started. The post writing includes submitting the blog post to the search engines to get it indexed as fast as possible. Most bloggers use automated ways to submit the new post to major search engines. Wordpress users have edge over other CMS Available online. Wordpress have built-in option to add sites to submit the post and circulate online to the major search engines as soon as you write and publish it. By default, Wordpress have few update services included but you can add more. You can read more about Update Services. How to add this Ping List URLs In WordPress Blog? In the Left Sidebar Go to Settings >> Writing >> Update Services Section. Copy and Paste the Above Ping list there. I'm very happy that you are able to add this ping list by yourself this is the initial step we have taken to Search Engine Optimization of the Blog. There are many things we need to take care of like optimizing your Blog On-page and off-page SEO. I will share all the SEO Tips and methods in my upcoming articles. 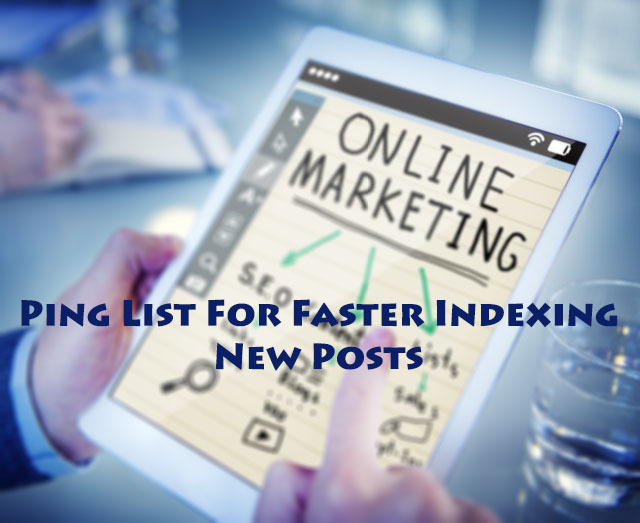 That's It Thanks For Following our Tutorial '' 155+ Ping Submit List - Fastest Indexing New Posts in WordPress '' Along With us If you found any difficulty Please Comment and Share Your Valuable Opinion. And Stay tuned for More Tutorials Like This and Share this with your friends.